As we hold on to the last remnants of the summer weather, Karen at Lavender & Lovage and The Hedgecomber's Janie have settled on a Mediterranean theme for this month's challenge. So ladies, here is my salted cod with spicy gazpacho for consideration. Bon appetite! Given the recent weather, this month's tea time treat challenge is perfectly timed - so, here are two of my all-time picnic favourites especially for the ladies at Lavender & Loveage and The Hedgecombers. Enjoy! Click on the image below for the full recipe. When I was learning to cook we were lucky to have a constant supply of edible flowers from the amazing husbandry school in Devon. One of the first things we learned was how just a few of these little gems could make a boring salad spring to life - and turn just about any kitchen disaster into a michelin starred work of art! So, when I saw that Karen over at lavenderandloveage.com and Janie at Hedgecomers.com were using edible flowers as the basis of their June tea time treats challenge I had to get involved. Take a look at my squid and chorizo salad entry or pop over to Karen's and see what other great recipes have been entered. For guidance on which flowers are safe to eat, or to buy them online, try this link from the good folk at Greens of Devon. Since starting this blog my focus has been on creating recipes that people might want to cook so visitors have an incentive to actually hang around for a while. This has been fun, but hasn't left much time for me to really engage with other bloggers. Now that I have finally reached the point where I think there is enough here to keep people interested it's time to stop being a wall flower and start making friends in the blogging community. As if to prove just how embarrassingly insular I've been I've only just discovered the world of blogging contests. 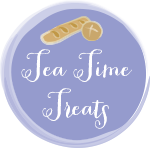 This is a great way to meet new people and get some of my hard earned recipes out there, so I think it's time to get stuck in - starting with the May "tea time treats" contest run by the lovely ladies at Hedgecombers.com and Lavender and Loveage. They are looking for tart ideas this month (no, not that sort of tart) so I am submitting the "undisputed king of tarts" - tarte au citron. Just click on the picture below to get the full recipe.